The Temple of Heaven is a worthwhile visiting place in Beijing. It is much bigger than the Forbidden City and smaller than the Summer Palace with an area of about 2,700,000 square meters. The Temple was built in 1420 A.D. during the Ming Dynasty to offer sacrifice to Heaven. As Chinese emperors called themselves 'The Son of Heaven' ,they dared not to build their own dwelling,'Forbidden City' bigger than a dwelling for Heaven. The Temple of Heaven is enclosed with a long wall. The northern part within the wall is semicircular symbolizing the heavens and the southern part is square symbolizing the earth. The northern part is higher than the southern part. This design shows that the heaven is high and the earth is low and the design reflected an ancient Chinese thought of 'The heaven is round and the earth is square'. The Circular Altar has three layered terraces with white marble. During the Ming and Qing Dynasties (1368 A.D. - 1911 A.D.), the emperors would offer sacrifice to Heaven on the day of the Winter Solstice every year. This ceremony was to thank Heaven and hope everything would be good in the future. The Hall of Prayer for Good Harvest is a big palace with round roof and three layers of eaves. Inside the Hall are 28 huge posts. The four posts along the inner circle represent four seasons-spring, summer, autumn and winter; the 12 posts along the middle circle represent the 12 months; and 12 posts along the outer circle represent 12 Shichen (Shichen is a means of counting time in ancient China. One Shichen in the past equaled two hours and a whole day was divided into 12 Shichens). The roof is covered with black, yellow and green colored glaze representing the heavens, the earth and everything on earth. The Hall has a base named Altar for Grain Prayers which is made of three layers of white marble and has a height of six meters. 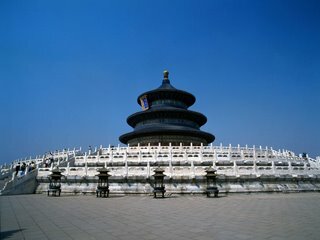 Another important building in Temple of Heaven is Imperial Vault of Heaven. If you look at it from far away, you will find that the Vault is like a blue umbrella with gold head. The structure of it is like that of Hall of Prayer for Good Harvest, but smaller in size. The structure was made of bricks and timber. The Vault was used to place memorial tablets of Gods. White marble railings surround the vault. The Vermilion Steps Bridge connects the Hall of Prayer for Good Harvest and the Imperial Vault of Heaven. The south end of the Bridge is lower than its north end. The emperors in the past believed that they could go to heaven through this Bridge, which is why this bridge is also called Sacred Way. A Yu Route and a Wang Route are on two sides of the Sacred Way. The former one is only for the emperors to walk on and the later one is for the princes and the high officials to pass. Three Echo Stones is outside of the gate of the Imperial Vault of Heaven. If you speak facing the Vault while standing on the first stone, you will hear one echo; standing on the second and then the third stone, you will hear two and three echoes respectively. Another interesting and famous place for you to visit is called Echo Wall owning special feature. The wall encloses the Imperial Vault of Heaven. Its perimeter is 193 meters. If you and your friend stand at the east and the west roots of the wall respectively and you whisper a word, then your friend will hear clearly what you say. Isn't it interesting? The phenomenon utilizes the theory of sound wave. Besides carefully designed buildings, there are also some other scenes that you can enjoy like Nine-Dragon Cypress. It got its name from branches which look like nine dragons wind with each other. It was said that the cypress was planted more than 500 years ago. Really, a grandfather tree!